Not all that long ago, I heard a technology company say that using a Managed Service Provider (MSP) for your IT services was a scam. The message was that paying a monthly fee for IT was a waste when you could just pay for the hours you need. This may sound good on the surface, it shows a misunderstanding of effective IT management. The MSP solution is actually the best way for most organizations with under 150 technology users to operate. A skilled Managed Services Provider (MSP) has software to monitor your systems, manage updates, provide help desk, and remote control your systems. They align your system with best practices, help you know what is next, and provide guidance to deploy new technology effectively. 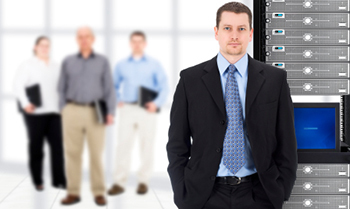 A skilled MSP can turn your IT from a fire drill into a smooth running machine. There are lots of other ways to get IT support. Many companies have an internal person who is dual-purposed with their real job and IT tacked on. Other companies have a dedicated on-staff person who does their IT, or maybe an IT person that comes twice a week or once a month. Still others use a block of hours from an IT vendor and that vendor comes when called. All of these methods of getting IT services will eventually come up short and will introduce a great deal of risk into your organization. Using a skilled Managed Services Provider just makes sense for several reasons. You are the continuous target of cybercrime. There are countless reports of ransomware, spear-phishing, and other malicious attacks going on every minute of every day. These attacks are directed at every computer user and business out there, including you. That malware or virus that was slowing you down last week was designed to steal information or steal control of your computer. Your data and up-time are valuable and it is critically important to have a 3-level security approach that covers preventing entry, detecting anything that might indicate a problem, and responding aggressively to remove the threat that may still get through. This 3-level security approach cannot be carried out without a managed approach to IT. If we look at a parallel to building security, you need strong door locks, a fully monitored alarm system, and a response team in the event that someone enters your building. The risk of being on the Internet means that every business needs this level of security. Being reactive about technology is costing you more than you realize. As we begin to help new companies, the focus is so often on a long list of ongoing problems and how fast response will be to those problems. Response times are important, but maybe if this is the first concern, it may indicate the need for a closer look. The real question should start with “why” these issues are occurring. What can be done to reduce the number of issues we experience? Reactive issues cost us in more ways than we realize. They slow down someone who is doing critical work. They create frustration and anxiety. In an unmanaged, self-help environment, often multiple people get involved to try to fix the problem before escalating it to an IT resource. If they go unresolved, it creates ill-will toward the company for not fixing the problem. A properly managed approach with give everyone the ability to get help through a qualified technical resource. More importantly it will have a strong focus on significantly reducing problems by aligning technology with best practices. You don’t know what your IT guy doesn’t know. Everyone has a different opinion about technology. How do you know that you IT person has it right? How do they know they have it right? If you are working with a single IT person, whether on staff, or outsourced, the chances are very high that they have a perspective that is outdated, skewed, or just plain wrong. Even if they start out on top of things, it is very difficult for them to stay up-to-date. All they see each day is the technology within your company with no exposure to other environments and often very little outside education. As we take over IT for new clients, we see this repeatedly. We see new and yet already outdated backup solutions that won’t provide fast recovery, and sometimes no recovery at all. We see overspending on technology that is just wrong or won’t ever be used. We see equipment that is purchased and never used because the technology person didn’t have time to install it. We see grossly insecure setups and way over-built security that makes it difficult for users to work. We see freeware systems that aren’t really free because they fail often and are very difficult to recover. This issue is solved by a good Managed Services Provider. They build a team environment where everyone contributes to a whole. They provide a consultant level individual who has oversight for the big picture and stays in-tune with technology changes and development. And, there is a strong emphasis on education and developing best practices that are used to create stability for your organization. You need more than a guy. You need a team. Nobody comes to the door asking for an IT team. In fact, when we begin to institute the team approach for some clients, we often hear things like, “John is awesome and I only want to work with him.” It is natural to gravitate toward an individual with whom you have created a relationship and trust. Having a team, though, is an essential part of good IT. You could liken it to a doctor’s office. You want to see the doctor, but you never would see the doctor if someone on his team didn’t manage his schedule. And, there are some things the nurse is just better at. And, for some things you need an X-Ray technician, and if you have a specific illness, you may need a specialist. IT is no different. The IT person who is really good at installing and configuring a new PC might not be your best resource to design a new redundant server solution. They also might not be right for creating a complex VLAN solution. And, that person who is great at working on your AD setup may not be up-to-date on the best way to eradicate that new virus. The team approach also eliminates the coverage issues that come up over vacation, illness, and the proverbial, “What if they get hit by a bus?” problem. In addition, with a team, there can be oversight one member can double-check the work of another. A well-formed team also includes a consultant level person who speaks the language of a business owner and can help build solutions that support business objectives. There is so much more to being effective with IT than merely fixing the problems that arise. IT has become a critical system that should support our business and too often does not. The days of the reactive one-person IT approach are long gone. Consider the benefits of working with a well-run outsourced MSP.